A couple weekends ago, I attended my very first baby shower. Not my first baby shower—no that one’s still a couple years away—but my first shower for a friend who is soon to be a mother. It’s not that I haven’t yet had friends who’ve become mothers. In fact, many of the girls who I grew up with are married and mothers and have even recently been blessed with baby number two. It’s just that I’m very far away from Wisconsin here in New York, and have unfortunately had to share in these joys via instant message or Facebook. I’m also admittedly not the most socially active individual and only recently settled into a network of friends here that makes me excited to put things on the calendar. Many of these friends are couples whose individual parts are as joyful to be around as their sum. I feel like this is rare and feel lucky to have these people in my life—especially now. We’re all young and building our lives and families and it’s amazing to be able to share this time of moving in together and getting engaged and planning weddings and having babies. It’s particularly amazing to be able to share it in person, and my heart feels so full with all the happiness I have for those around me. And when my heart takes a shine to you, you will very likely be receiving some goodness from my kitchen. What can I say? My heart’s a baker. So it was that one hot Saturday afternoon in Brooklyn, six ladies gathered to celebrate the fact that one of them will soon be bringing a baby boy into the world. There were paper plates and napkins decorated with baby zoo animals. A giraffe with a flurry of blue, curly ribbons tied around his neck sat happily in the center of the table, and a bouquet of orange roses brightened the room. An assortment of brunch-type fare was served: candy-sweet caramelized onion and goat cheese quiche, adorable baby hashbrown nests filled with sour cream and chives, mixed berries and melon, and a caprese salad with tomatoes and basil straight from Jen’s terrace garden. For dessert, there was a warm-from-the-oven blueberry crumble and, to class things down a bit, these gluten-free watermelon cupcakes. I’m sorry, I just couldn’t resist. 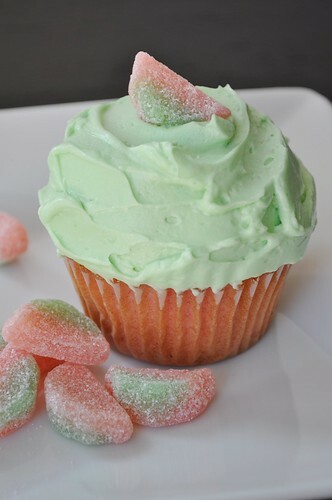 Our soon-to-be mama Courtney has been on a watermelon kick during these pregnant summer months, and when her husband Doug reminded me of that in an e-mail that also included the words “cupcakes” and “sour gummy candies,” my creative drive took a maniacal shift. More fitting things like zucchini bread or tartlets or dainty little cookies took an if-there’s-time backseat. 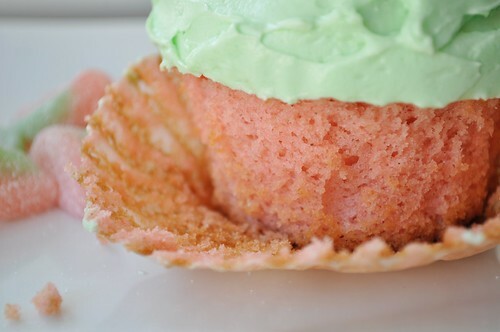 There would be watermelon cupcakes. 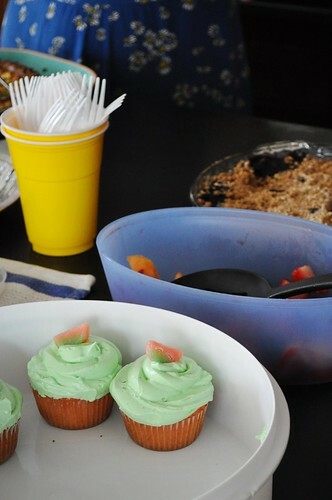 The question I then faced was: How exactly does one make a watermelon cupcake? I wanted badly to flavor them naturally with watermelon puree or simple syrup, but a bit of research determined that the watermelon flavor would get lost in the cake. Bummer. So I researched some more, took a tip and a venture out of the produce aisle, and decided to use watermelon-flavored gelatin. Even though I was compromising my integrity a smidge, I decided that I still wanted the cake itself to stand up. 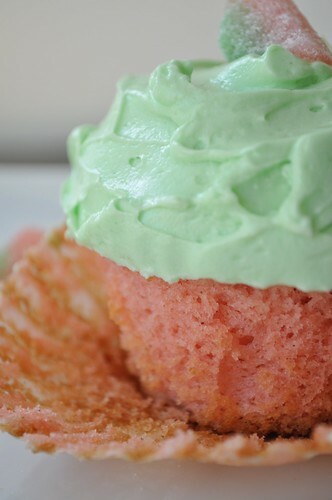 I searched once more and found a worthy and well-reviewed cupcake recipe for adaptation, added in the gelatin, and voila! 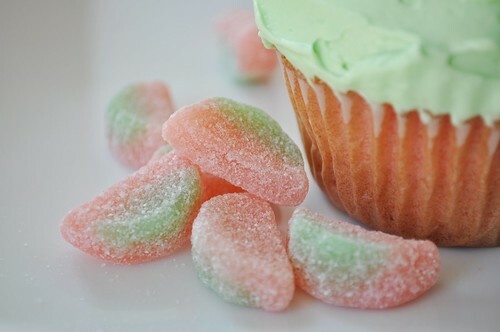 Watermelon cupcakes. I know what you’re thinking, and yes, they’re a tad strange. They taste nothing like what you expect a cupcake to taste like and every bit like watermelon candy. It’s a combination that makes you giggle and widens your eyes. Chris found them too bizarre for his tastes, though he agreed that the texture of the cake was good. All the women who have tried them, however, have gotten quite a kick out of them. They’re surprising and fun and would be well suited to any shower situation or girly gathering. I imagine they’d be a total hit with kids as well. To top off the cupcakes, I used a pretty traditional homemade buttercream (this recipe from Gale Gand is light and not too sweet, a very nice contrast to the cake), in part because homemade is always better and also because I’ve yet to find a decent store-bought frosting that doesn’t contain hydrogenated oils. Several drops of green food coloring furthered the watermelon theme. Of course, feel free to use the frosting of your choice—though I will recommend using a very basic flavor. I’m just not sure how watermelon and cream cheese would taste in combination. I also want to point out that, if you felt so inclined, you could use any flavor of gelatin to execute this recipe. Strawberry or cherry would be pretty sane options, but you could certainly branch out to things like grape or blue raspberry if you’re really looking to raise some eyebrows. But these cupcakes here? These were all about Courtney. Watermelon all the way, with a sour gummy watermelon candy on top. 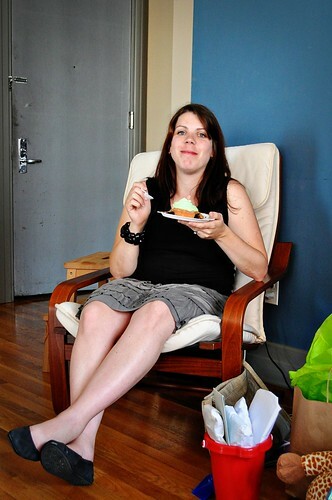 It was a lovely shower with a fantastic bunch of ladies and a bizzaro batch of cupcakes for a truly wonderful mom-to-be. I’m glad this was my first shower and I’m glad I got to be there to help celebrate this exciting time. Congrats Doug and Courtney—we can’t wait to meet your boy! In a medium bowl, whisk together the sorghum flour, millet flour, tapioca flour, potato starch, xanthan gum, baking powder, salt, and the packet of watermelon gelatin. In a large bowl, beat the butter until pale and fluffy. Cream in the sugar. Add the eggs, one at a time, and the vanilla, mixing well. Add the 1/3 of the flour mixture into the butter mixture at a time, alternating with 1/3 of the milk, until all the ingredients are combined. The batter will be very thick and voluminous. Stir in 25 drops of red food coloring. Divide the batter among paper-lined muffin tins, filling the cups 2/3 full. Bake for 15-20 minutes, until golden and a toothpick inserted in the center comes out clean. Allow to cool completely before frosting.